Tick Tock...Last 2 days of the season! 19.05hrs Saturday 20th April 2019. Still some good granular spring snow to be had at Glencoe on the upper Mountain and the Wall! Come and bash some spring snow bumps on the Main Basin! Only 2 days left for lift served riding. From Tuesday you'll have to hike! Get an early weather check with our webcams, first images shortly before 5.30am. Not so much spring in the air, but summer at Glencoe this Easter weekend. The plan is for Easter Monday to be closing day, but maybe get up Sunday just in case the uptrack does not make it. Fingers crossed though because Monday should be a warm and sunny day to round of the lift served season for 2018/19. While there are still complete runs up on CairnGorm, more people are on the beach at Loch Morlich with the season now officially over as with no operating non surface uplift there is no lift served way to the Upper Cas and Top Basin. Glencoe is now the only area able to offer lift served snowsports. The snow has remained too loose and granular for the groomer to climb the Haggis Trap or Ski Tow Gully, so unless the snow unexpectedly firms up overnight it will remain as it is. That means the bumps are now building nicely (or horridly depending on your view point) the entire length of the Main Basin, but in particular through the narrows of Island Rock Gully and the Haggis Trap. The wider upper areas of the Main Basin have plenty of flat snow to escape the bumps and the Spring Run has only the mellowest bumps and is well worth the walk over to it. The Flypaper Bowl and the gullies off the East Ridge have been seeing action in the warm spring sunshine, but these are serious and exposed undertakings in the receding spring snowpack, please have a chat to patrol before venturing beyond the Spring Run. Aside from the snowfactory snow on Old Mugs Alley there is almost no snow on the Plateau, so it is an approximately 7 minute walk over to the Cliffhanger Chair and Plateau Cafe from the top of the Access, however the snowfactory snow does mean there remains a good sledging area outside the Plateau Cafe. Given the moderate winds there has been a marked increase in snowmelt rates compared to last weeks sunny and mild period, so there is a risk the Main Basin uptrack and connections wont make Easter Monday, so do check for updates over the holiday weekend. There are a couple of kickers of varying sizes built over natural features around the Main Basin at Glencoe. Island Rock Gully and the Haggis Trap are riding as a shallow natural half pipe on the Main Basin. A rider X course was situated on the Upper Cas under the T-bar downline, this is not being maintained and uplift is now closed for the season. The CairnGorm Funicular is closed indefinitely and will not run this spring or summer and as a consequence the mountain has now closed for the season despite the Top Basin, Traverse, 105 and upper Cas remaining skiable. The proposed ?2.5m rebuild of the Ptarmigan Restaurant brought forward by Natural Retreats is now being pursued by HIE and is provisionally scheduled to go to the Cairngorms National Park Authority planning committee in late April. An HIE hosted open business breakfast event is scheduled for Wednesday 1st May in the Macdonald Aviemore Resort from 8am to 10.30am on the future of CairnGorm Mountain. As we see the surface layers thaw out, older and denser snow is coming to the surface and despite the high temps are giving some fantastic granular spring snow surface conditions to round of the season this Easter. Sunday will see the wind back Southerly and as it does so some brighter spells will begin to develop by late morning or early afternoon in the West. Munro Level temperature will creep up again in the afternoon, peaking around +10°c to in North and West Lochaber +12°c. South 20 gusting 30 to 35mph. Indications for Monday are for largely unbroken sunshine for the West Highlands, Munro Level temps could nudge 13 or 14°c with a moderate SE wind for Glencoe, but the wind speed is likely to be higher possibly touching Gale Force through the Nevis Range mountains and on / downslope of the Cairngorm Plateau through the first half of next week. With the wind coming from the SE quadrant the best of the overhead next week will be in the West, while another widely Sunny day is expected on Tuesday, there looks to be a bit more cloud around mid-week. The season is now officially over at Allenheads. All other club fields require new snow if there is to be any further riding this season. Please check all club fields access Ts&Cs as day tickets are not always available and some are members only due to insurance conditions. Lowther Hill: Off grid Summit Camera and Leadhills Village Camera online. CAIRNGORM: Aviemore Cams online. Loch Morlich Cam is back online, apologies for the down time over the weekend. GLENCOE: Sledge Park cam relocated to show current sledge park across from the Plateau Cafe. Mid mountain camera is broken and awaiting a replacement. 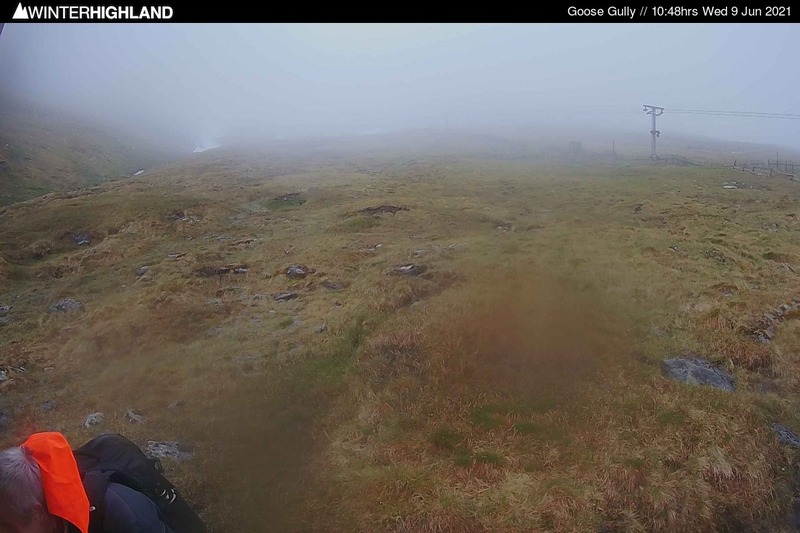 NEVIS: Front of mountain cams online. Laying out a turn in fantastic granular spring snow on the Main Basin. Launching into the Main Basin from Island Rock! Good granular spring snow. Next few days Sunny with light winds - get up while you can! Not the Saturday we were expecting, but forecasts show it brightening up on Sunday! Main Basin from the T-bar. 1300ft of vertical with good options mid and upper mountain.